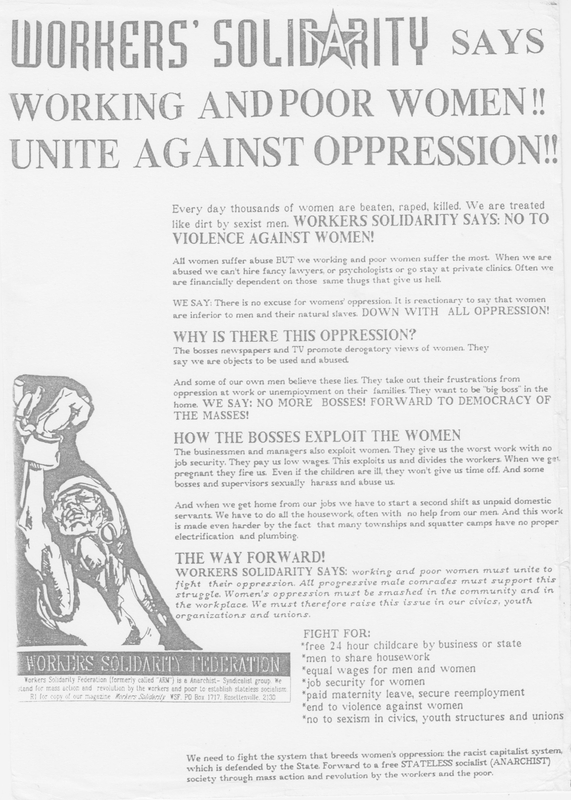 The leaflet below was issued by the Workers Solidarity Federation (WSF) in thousands of copies at a Women’s Day march in Johannesburg, probably in 1996. As was typical of WSF, it takes a no-class-struggle-without-women’s-freedom and no-women’s-freedom-without-class-struggle line. The (undated) leaflet below was issued by the Workers Solidarity Federation (WSF) section in Durban, in the latter half of the 1990s. The original text was sourced from elsewhere. 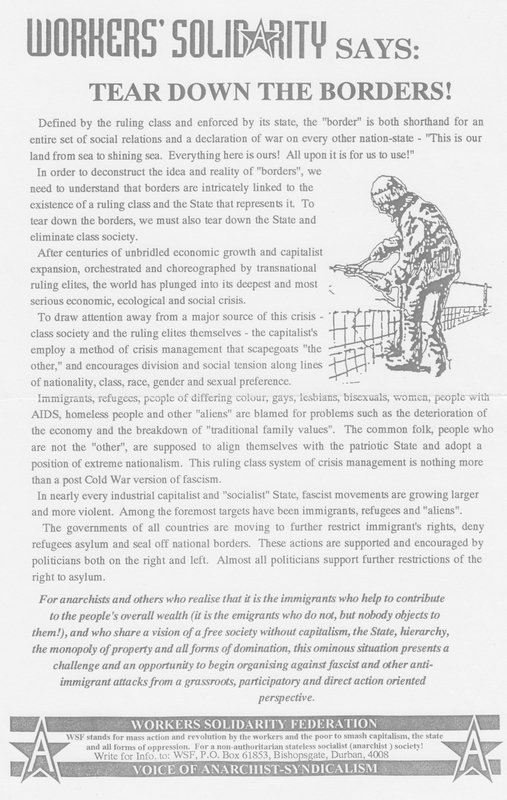 The leaflet opposes xenophobia and the persecution of working class immigrants, illegal and otherwise, a problem that still bedevils South Africa, as the horrors of the May 2008 riots (and many before and since) show. The leaflet places the blame squarely on capital and the state, and argues for working class unity. 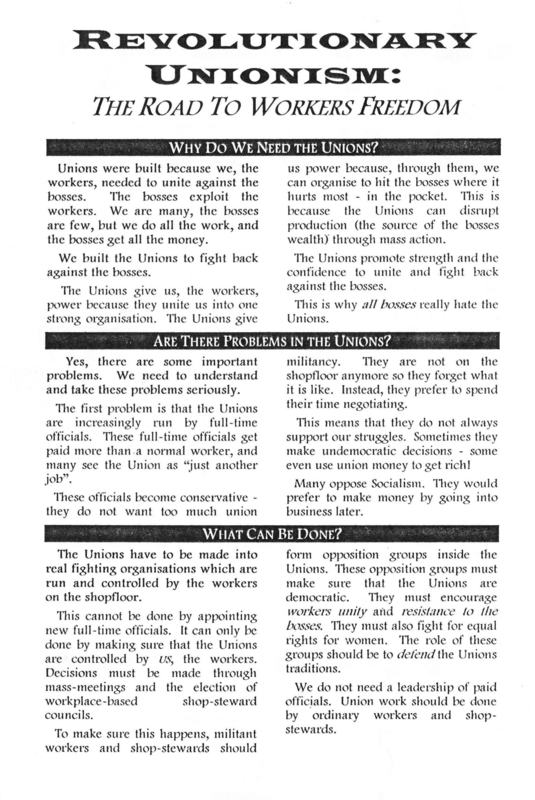 A leaflet written by the Workers Solidarity Federation (WSF), for union activists. It takes a generally pro-trade union line but argues that the existing unions must be reformed to be more democratic structurally, and more revolutionary, ideologically. In effect, it advocated transforming the existing unions into unions on anarcho-syndicalist lines, as vehicles for a current battles, as well as a final showdown in the form of a revolutionary general strike. Another version here. As the contact details showed, the WSF was now active both in Johannesburg and Durban. It’s lively Durban branch would play a growing role in the production of pamphlets and posters, especially in the Zulu language. 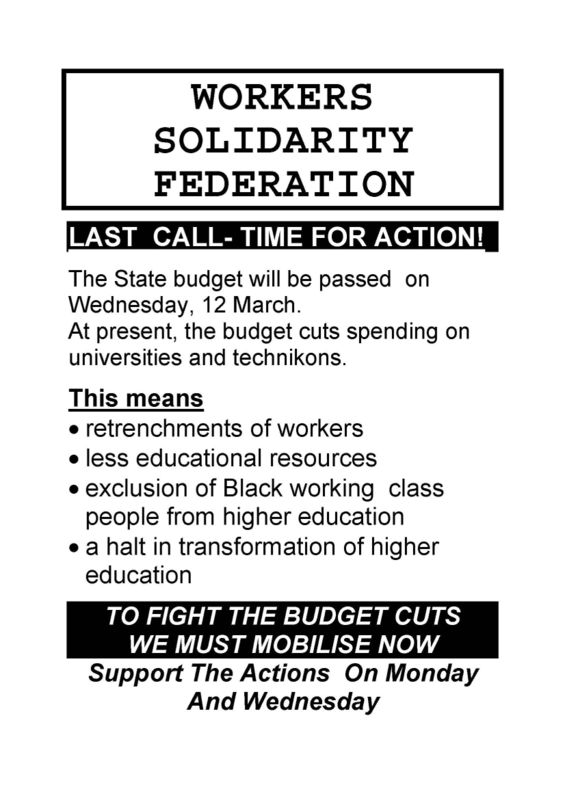 This was a leaflet issued by the Workers Solidarity Federation (WSF), for a national university student protest in Pretoria. 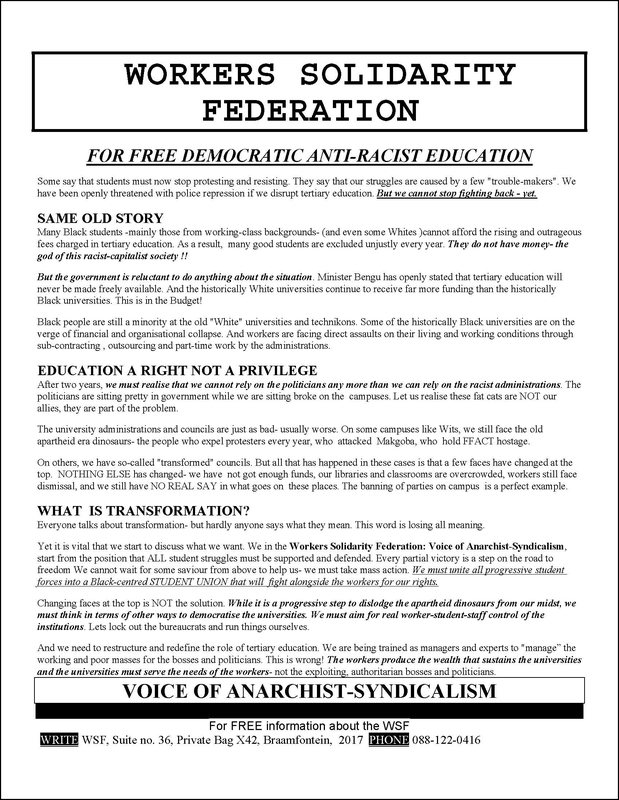 It argued for free university education, pointing to the class and national / racial effects of current policies; it also raises again the WSF slogan of the “Workers University.” Given that the student movement was (and is) fragmented into student wings of major political parties, the leaflet also proposed the formation of a non-party “student union,” as existed elsewhere e.g. in Britain. This suggestion did not gain traction: today the student movement is even more fragmented: while the ANC-linked current still dominates the student scene, SASCO now co-exists with the young wing of ANC ally, the South African Communist Party (SACP), this being the Young Communist League (YCL), and the ANC’s general youth wing, this being the ANC Youth League (ANCYL). These are loosely linked into Progressive Youth Alliance, with some overlapping membership. 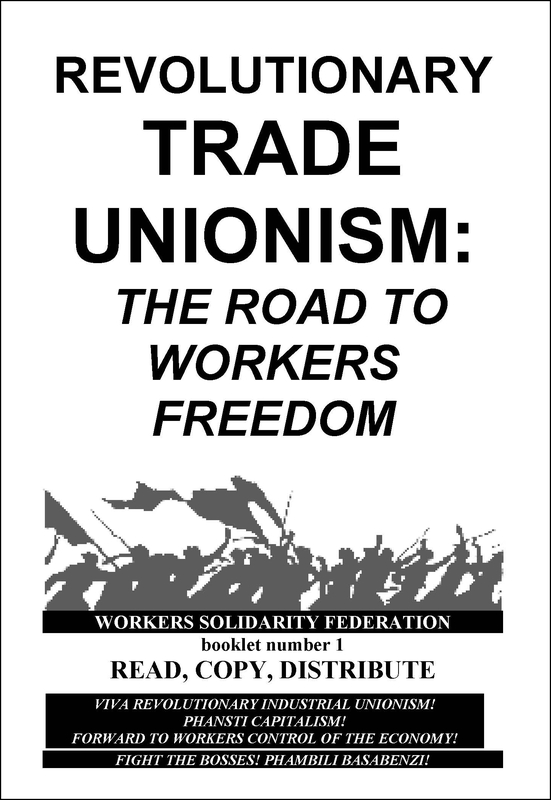 This leaflet was issued by the Workers Solidarity Federation (WSF), and advocated an anarcho-syndicalist approach to trade unionism. It was directed to, in reality, to rank-and-file members of the Congress of South African Trade Unions (COSATU). Another version here. While “anarcho-syndicalism” in certain English-speaking countries has come to be tied to a strategy of “dual unionism” (the formation of brand-new unions on a purely anarcho-syndicalist platform, outside the existing orthodox unions), the WSF and its successor organisations consistently argued for the reform of existing unions along anarcho-syndicalist lines. WSF disagreed with dual unionism on grounds including 1) it isolates radicals in marginal unions, rather than relating to large masses in the orthodox unions; 2) such isolation would be to the benefit of the most conservative and bureaucratised elements in the existing unions; 3) dual unions tend to recruit workers neglected by existing unions, meaning it cannot be assumed that their enrollment in the new “anarcho-syndicalist” unions is any sign of the increase in popular “anarcho-syndicalist” consciousness; 4) the current members of existing unions are highly unlikely to leave those existing unions, to join small and untried radical unions; 5) existing unions, no matter how conservative , are still genuine mass structures of and for the working class; and 6) historically, internal reforms have successfully transformed orthodox unions into mass revolutionary (or anarcho-syndicalist) formations, including notable examples like the French CGT and the Argentinean FORA. The WSF rejected the notion that there was any contradiction between anarcho-syndicalism / revolutionary syndicalism and the Bakuninist/ Platformist/ especifist approach of organisational dualism i.e. the necessity of building a Bakuninist organisation of tendency that works within the existing mass working class structures (e.. orthodox unions). First, because such an organisation would be ideal for promoting and defending anarcho-syndicalism / revolutionary syndicalism as a strategy of counter-power and counter-culture; second, because this could be promoted and defended inside existing unions; third, because there is no necessary link between anarcho-syndicalism / revolutionary syndicalism and dual unionism; and finally, because there is a very notable strand of anarcho-syndicalism / revolutionary syndicalism that did, and does, recognise the need for specific anarchist (or syndicalist) political organisations, in addition to anarcho-syndicalist / revolutionary syndicalist unions (example, the FAI in the Spanish CNT, and Bakunin’s Alliance in the First International). In 1997, the young African National Congress (ANC) government – which had been in the Transitional Executive government in 1993, then swept the 1994 general elections, and the 1995 local government elections – continued its implementation of neo-liberal measures. These had surprised many people, because the ANC was elected on a largely Keynesian social democratic platform (exemplified by the Reconstruction and Development Programme, or RDP). The issues around why the ANC made the shift do not matter here. What concerns this entry is that a) this entailed cuts in spending to all universities; b) hardline ANC supporters presented this as an attack on “elitism” (especially since it affected the top, historically white, research universities); butc) in reality, it meant higher fees for working class students, including the majority of blacks, job cuts to (and outsourcing of) service staff (again, largely black and poor), and worsening conditions all round (including for academics). Senior leaders of the ANC-aligned SA Students Congress (SASCO) found themselves championing the neo-liberal measures. By contrast, rebels within SASCO, and other left forces, opposed the cuts. 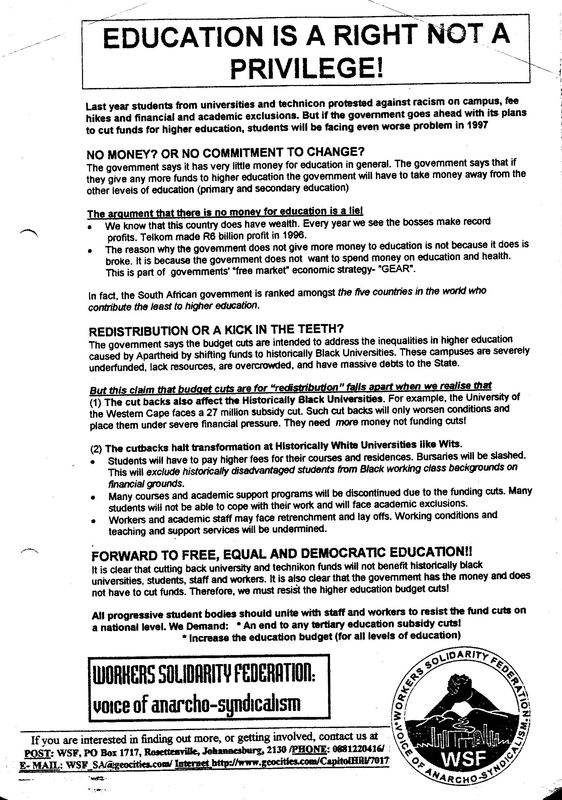 The leaflet below was issued at the University of the Witwatersrand (Wits), where the independent (and quite Marxist) “Wits Against Cuts” group was active. The anarchist Workers Solidarity Federation (WSF), then active on that campus (it was soon to shift its focus off-campus), issued the below statement in early March 1997 and supported the Wits protests in various ways.